I have lived in Los Angeles for a decade now and I love it, but it is missing a few things. The biggest one being Mardi Gras. Apparently, no one wants to let the good times roll over here. On the Gulf Coast, every city had their own Mardi Gras parades and celebrations, so I grew up assuming it was beloved by the entire nation. I was in for a rude awakening. It’s nearly impossible to find someone selling a king cake out here. Luckily, Janette is good to me and has one overnighted from New Orleans every Fat Tuesday. But what if I want more? What if a simple king cake just isn’t enough for me? Well, that’s where king cake ice cream comes in. 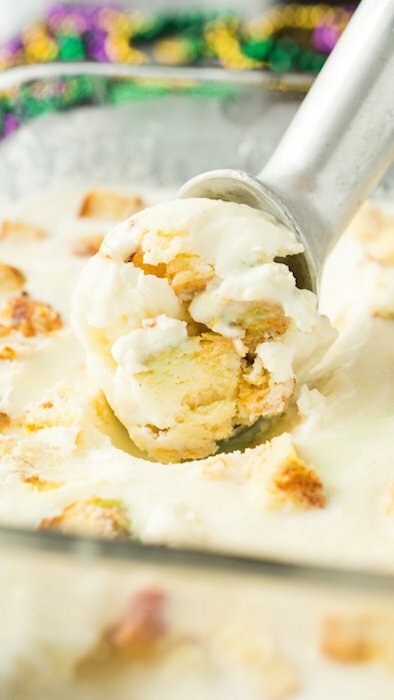 I had never thought of king cake ice cream until I was browsing instagram and saw a pic of Blue Bell’s version. What a phenomenal idea! Unfortunately Blue Bell is another thing LA is missing, so I had to set out and make my own. 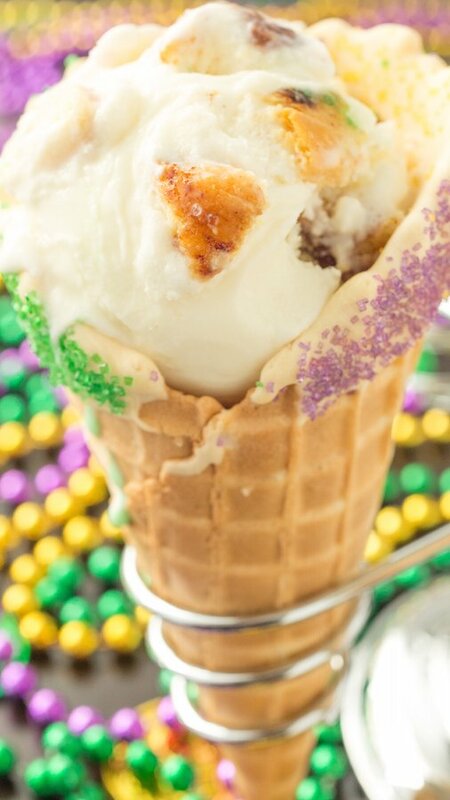 My king cake ice cream recipe is cream cheese based with hints of cinnamon and vanilla. I wanted to put in real pieces of king cake, but since I don’t have easy access to any, I made a batch of quick & easy king cake using canned cinnamon rolls. I LOVED the ice cream, my only regret is that I didn’t have a Shrimp Po’Boy to eat before it. 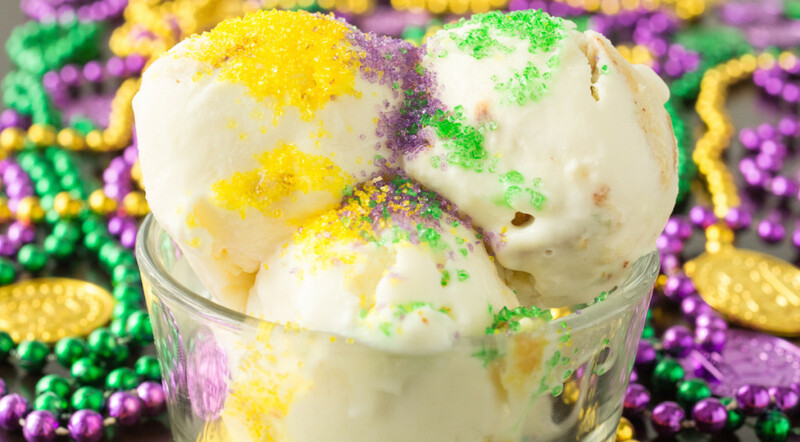 Whether you’re in an area that celebrates Mardi Gras or not, I strongly suggest you make this king cake ice cream recipe for Fat Tuesday! In a medium saucepan, add the whole milk, heavy cream, sugar, corn syrup, and cinnamon. Over medium heat, stir until sugar is dissolved. Using a stand mixer, whip the cream cheese and lemon zest together for 3-4 minutes. Change the mixer to it’s lowest setting and slowly add the milk mixture from the saucepan. Add vanilla. Mix until incorporated. Pour the ice cream into your ice cream maker and follow manufacturers instructions. In the last 1-2 minutes of mixing, add the chopped king cake. 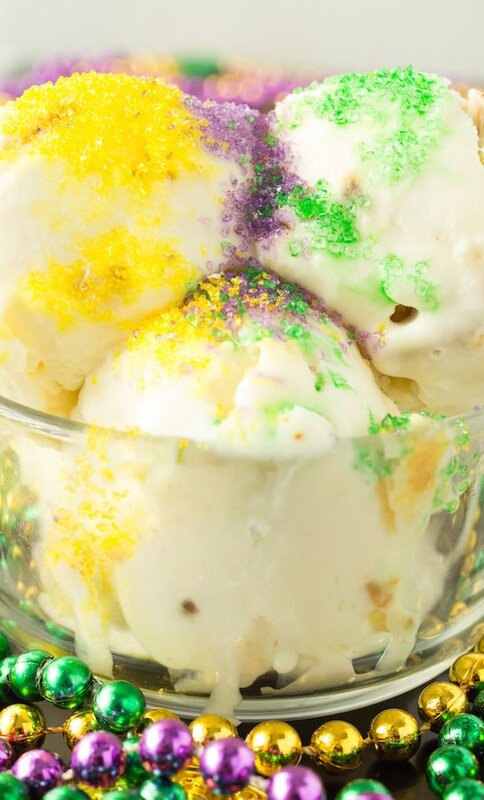 If your king cake ice cream is too soft, place in the freezer a few hours before serving. Enjoy and laissez les bons temps rouler! Whoa-cream cheese ice cream with cinnamon and vanilla sounds phenomenal as it is, and adding bits of cinnamon roll!? Laissez les bon temps rouler, indeed! Bonne fête! This sounds so so delicious! 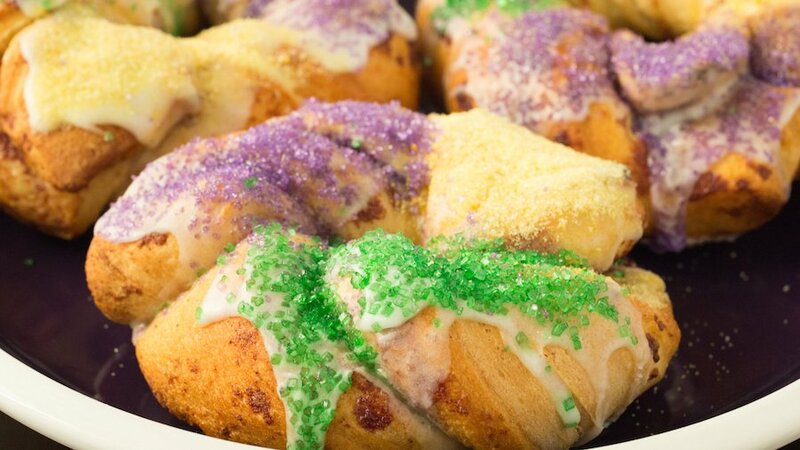 I’d love to try king cake! Didn’t see cream cheese in recipe?